Amazon has LEGO Star Wars Jakku Quad Jumper Building Kit $30 (Reg $50) with free shipping. 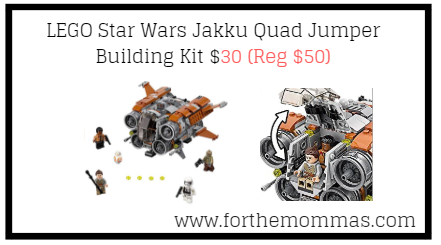 Build a Quadjumper with pop-off “exploding” engines, and play out action-packed adventures on Jakku. Featured in Star Wars: Episode VII The Force Awakens. Includes Rey, Finn, Unkar’s Thug and a First Order Stormtrooper, plus a BB-8 figure.